Yes, I am a seventies child and now I can’t get that tune out of my head. That is why I am sharing a photo that depicts everywhere a sign and that also depicts the favorite place to buy malasadas if you live on Oahu. Everyone’s favorite Malasadas and I love the sign that I cut off about please don’t park at 909 Kapahulu since this was exactly where I was when I took the picture. 😉 Don’t worry, I did not leave my car and I wasn’t there long. 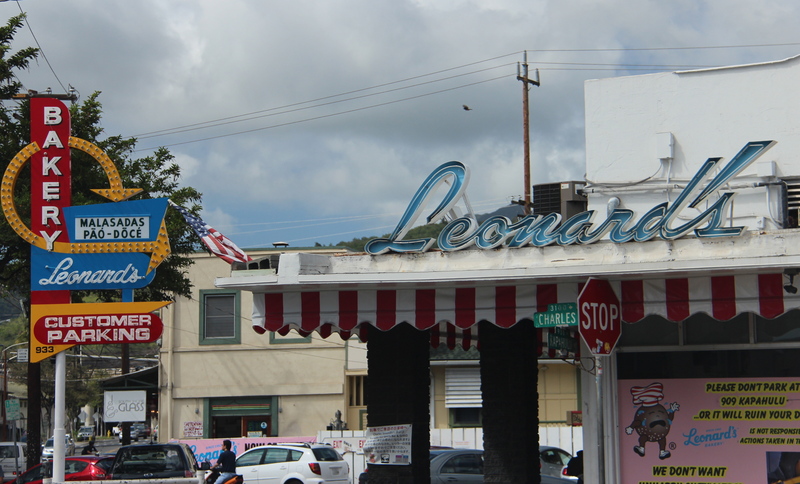 I wrote about Leonard’s previously. The owner is also a sweet man who came out of retirement to personally bake a dobash cake for my birthday last year, thus destroying my diet, but bringing a smile to my face. I am grateful to him. This week’s photo challenge is brought to us by Sara Rosso. We are to share a picture of a sign and explain why we chose that picture. Click on the link to find other posts and/ or to learn more.